A corner is in its right position if the 3 nearer center colors are the same 3 the corner has. It’s possible that the four corners are in their right position from the beginning (skip to the next step), that there is one corner in its place, or none. If there’s only one in its position, follow one of the first two solutions whether you see the right method to place the rest of the corners in their position. If there isn’t any corner in its position, follow any of the two previous solutions and you will get one of the corners put into its place. Finally, follow the solution depending on the case you have obtained. What does “+ Repeat Step 6” mean? You will not be able to solve this case directly. However, if you perform the movements specified, you will get another case for this step. Now we’ve solved the Rubik’s Cube in order to put the corners into their position. In the last step we’ll see the solution to make the corners rotate till we end up with the solved Rubik’s Cube in your hands! In that case, your cube is unsolvable. 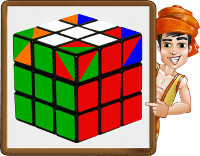 Take a look at how to fix your unsolvable Rubik’s Cube.